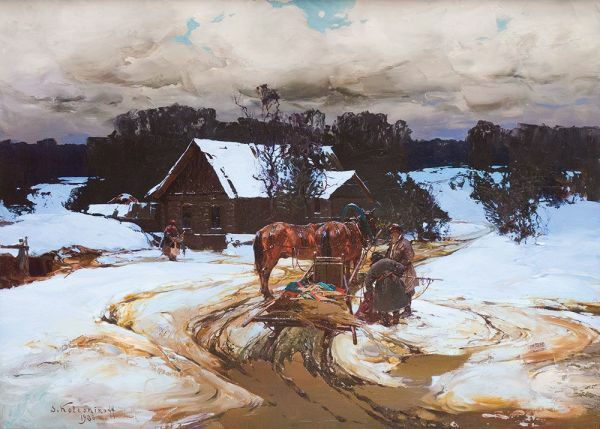 Buy works – Kolesnickov Stepan Fyodorovich | (1879, с. Andrianapol, Ukraine – 1955, Belgrade). Kolesnickov Stepan Fyodorovich (1879, с. Andrianapol, Ukraine – 1955, Belgrade). Studied at Odessa Art College (1879-1903), at Academy of Arts under I.E. Repin, V.E. Mayakovskiy, A.A. Kiselyov (1903-1909). Lived in Odessa. Participated in exhibitions initiated by the Association of Southern Artists, the Association of Itinerant Art Exhibitions. His one-man show took place in halls of the Society for the Encouragement of Artists. In 1920 emigrated abroad. The artist’s works are exposed in the Tretyakov State Gallery, the State Russian Museum, in regional museums and in private collections. Year: The second quarter of the 20th century. Technique: Tempera, paper on canvas. 310000 - 310000 rub. 310000 - 310000 rub.